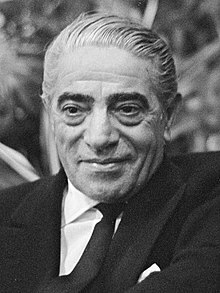 Aristotle Socrates Onassis (January 15, 1906 - March 15, 1975) was a prominent Greek shipping magnate and founder of Olympic Airways. Onassis was born in Smyrna (now Izmir), Ottoman Empire, into a prosperous Greek family. He received a good education and became fluent in several languages. In 1922, when Turkey took possession of Smyrna, the Onassis family lost most of their fortune and had to flee to Greece. The following year, Onassis left for Argentina where he quickly established himself as a prominent businessman. He later began to invest in shipping and eventually acquired a large fleet of freighters which made him one of the richest men in the world. In 1957, he founded Olympic Airways. He converted one of his ships into a luxury yacht called Christina, which he used to entertain famous people (artists, politicians, royalty, etc.). He married Athina Livanos (1926-1974) in 1946, with whom he had two children; Alexander (1948-1973) and Christina (1950-1988). In the late 1950s, he met diva Maria Callas and began a liaison with her that led to his divorce. In 1968, he startled the world by marrying Jacqueline Kennedy, the widow of slain President John F. Kennedy. He died in Neuilly-sur-Seine, France, from complications of myasthenia gravis and pneumonia, aged 69. This page was last changed on 1 February 2019, at 10:29.